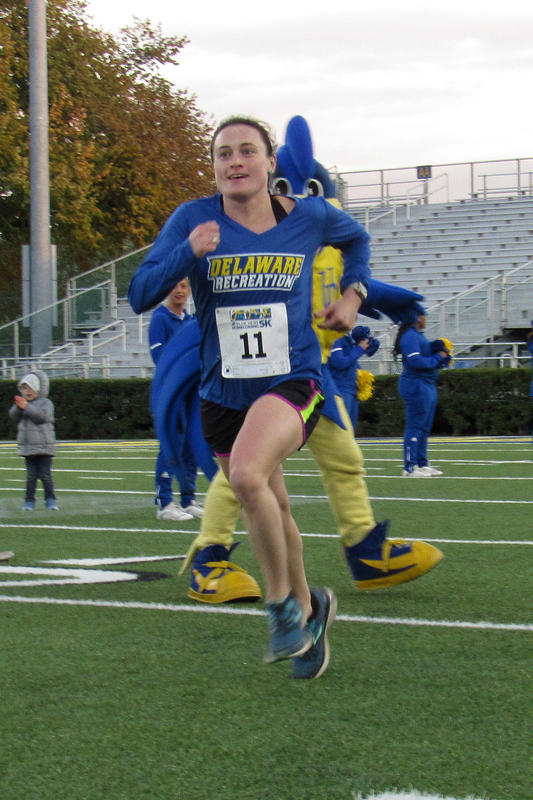 Bruce Weber finishes the 2018 Blue Hen 5K (photo courtesy of Races2Run). The home course means “home cookin’,” and that’s just what several Creek Road Runners enjoyed this morning on Creek Road in the 10th Annual Blue Hen 5K, as part of the University of Delaware’s “Dela-bration” Alumni Weekend. Leading the way was CRR Bruce Weber, UD’s dean of the Alfred Lerner College of Business & Economics. Weber was all by himself in second place overall, not close to the leader but way ahead of anyone else, posting a 19:39 along the Creek Road course. In doing so, Weber was also the top master’s runner. Age-group winners Deshon, Anderson, and Weile are happy with the results (photo by Doug Baker, courtesy of UD). Three others came away with age-group wins. CRR Dan Weile has been running well lately, and he placed 5th overall on the day, winning the 40-49 age group in 20:30. In winning the 60-69 age group, CRR Mark Deshon ran a decent 21:26, finishing 10th overall—a great way to celebrate the 40th anniversary of his UD graduation. On the distaff side, a very fit CRR April Anderson headed the 70-and-overs in 39:32. Kids of Creek Road Runners even garnered some medals. 14-year-old Ben Schultz, son of CRR Dave Schultz and CRR Christine Schultz, took 3rd among the 13-19s and 14th overall in 22:52. Molly Shay, 12-year-old daughter of CRR Mike Shay, won the 12-and-unders with a 24:50 and was the 4th woman finisher. Creek Road Runners extends condolences to the family and friends of 84-year-old John Schultz, who was not one of our group but surely raced on Creek Road dozens of times over the past few decades. He was struck and killed by a truck while crossing the street at on Friday night. Rest in peace, John; your race is complete. 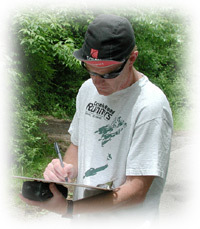 John was a member of the Pike Creek Valley Running Club.